Arrival at Ivato International airport. After custom clearance, meeting and assistance by an english speaking agent. Overnight at the hotel on bed and brekafast . After a delightfull breakfast, leave to Perinet, 150km East of Tana for about 3h drive through a beautiful landscape of rice paddies and wooded hills. At midway, stop at a special place called the Pereyras reptile farm to see about 20 species of chameleons from the largest one in the world called the Parson’s chameleon of approximately 60cm long to the smallest in the world, the Brookesia minima which can stand on a match stick. But this private park provides shelter for snakes, amazing colorful frogs such as mantellas and the tomato frogs, geckos and tenrecs. Overnight at the hotel on half board. Visit of the National Park of Mantadia Perinet in the morning where inhabit a large of variety of endemic birds and other species of lemurs such as the bamboo lemurs. It’s also an opportunity to find out the beauty of the ever green rainforest and other places such as the sacred water fall and the natural swimming pool. Picnic lunch at the National park is advised. Breakfast and then visit of another park called Vakona private reserve which encompasses 2 parts: the first one is the lemurs island where 4 species of lemurs live on a small island. The highlight of this visit is that you can feed the lemurs and caress them. They will jump on your shoulders and heads. The second part of the visit will allow you to see and to have an idea of how the Fosa looks like. The Fosa is the largest endemic carnivore living in Madagascar. Radiated tortoises and boas are to be seen also there. Overnight on Half Board . After breakfast, take the road to reach Manambato through the city Brickaville ( city planting sugar cane). Boarding a boat to secure the first part of Pangalanes sailing on lakes and lagoons engine. Arrival in Ankanin’ny Nofy (which can be translated through the focus of the dream). The afternoon will be free. You can just relax on the sand beside the lagoon, or swim or walk around. Overnight on Half Board . Two full days to enjoy the magical charm of this paradise. Visit the Palmarium reserve to enjoy the view of lemurs, including the Indri Indri, the largest lemurs of Madagascar, chameleons and birds, all as beautiful as each other. The afternoon will be free again, that is to say, swimming, reading, etc… Overnight on Half Board . After breakfast, return by boat to Manambato , then drive to Tamatave .Visit a park around Tamatave called Ivoloina park. Overnight on Half Board . Overnight on bed and breakfast . After brekafast, an optional visit to the crafts market before flying out from Madagascar with the assistance of a guide at the airport. Leave Tana and drive westward for about 140km through scenery of rice paddies, hills and villages to reach the volcanic area of Itasy, the third largest lake of Madagascar (45km²). First visit at the Virgin Islet, 5km from Ampefy village, located on the edge of the Itasy Lake. This islet on which a huge statue of 6m high of the virgin is standing, offers a great viewpoint to scan the lake and the surrounding countryside. In the afternoon, short drive to the Lily waterfall through scenery of volcanic cones. After breakfast, we keep going westward for about 12km to go to Andranomandroatra (place of boiling water), where one can see hot water coming out from cracks in the rocks. Possibility of therapeutic shower or bath in a pool. Then short city tour in Antananarivo (Tana for shorter), capital of Madagascar. Overnight at the hotel on bed and breakfast. Leave Tana and flight to Majunga, on the Northwest cost of Madagascar. Then drive inland for 2h30 to Ankarafantsika National Park. Arrival at the reception area of the park and check-in. Night walk led by a local guide will be arranged before dinner to see small nocturnal lemurs (mouse lemurs) and chameleons of different sizes. Back to the camp. Overnight on half board. After breakfast, the whole day to visit the Ankarafantsika National Park. In the morning, 3 to 4 hours to explore one section of the park, to look for lemurs, birds, snakes and chameleons. In the afternoon, boat ride on the lake Ravelobe, part of the park, to see numerous endemic aquatic birds such as Herons (Humblot’s Heron), the Madagascar Jacanas, Ibises, ducks and the famous Fish Eagle. The second part of the afternoon visit is to admire majestic baobab trees, one of the seven species growing in Madagascar (among the eight species growing in the world). Optional night walk depending on the success of the first one. Dinner and overnight at the camp on half board. Then, drive back to Majunga. Before the check-in at the hotel, a hook to the Red Circus will be organized. It is an eroded hill with its amphitheater shape showing all the shades of colors between red and white. The best time to visit is a sunset. 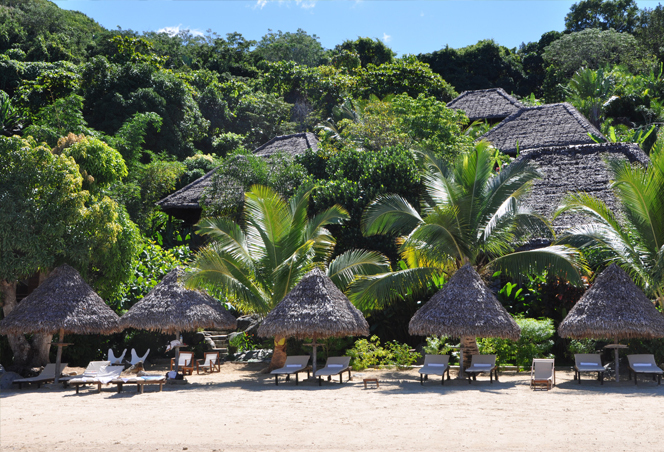 After breakfast, drive to Antsanitia seaside resort located 25km north of Majunga. Day at leisure, many sea activities can be organized by the hotel; deep-sea fishing, boat ride on a catamaran with snorkeling or diving. Dinner and overnight. One more day to relax. After breakfast, drive back to Majunga to catch the flight to Tana. According to the landing time in Tana, shopping at the craft market before flying out with the assistance of a guide. After breakfast, shopping at the craft market before flying out with the assistance of a guide. Flight from Tana to Nosy-Be, island located on the North West coast of Madagascar, in the Mozambique Channel. On that day, after breakfast, visit of Lokobe reserve, a nature reserve located on southeastern side of Nosy Be. Nosy Komba: Visitors can enjoy there a close contact with domesticated lemurs (the black lemurs or Eulemur Macaco Macaco) because they easily come to eat bananas in tourist’s hand and come and stay on their shoulders. But this island has very nice beaches too ideal for swimming. 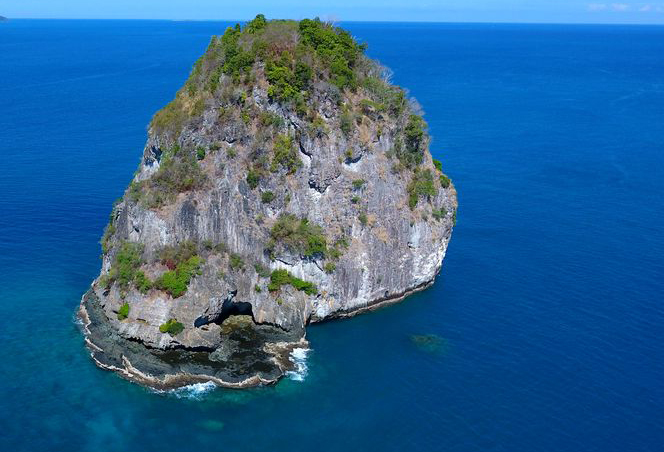 Nosy Tanikely: This island presents a broad sandy beach and the under-sea world around is wonderful with its shallow reefs and sea grass attracting turtles and countless colorful fishes. It is a favorable place for those who have passion for sub marine dives and free diving. Back to Tana with an optional visit to the crafts market according to the arrival time from Nosy-Be before flying out from Madagascar with the assistance of a guide at the airport. Someone will welcome and assist you. Transfer to the harbor of Nosy-Be where a crewmember will help you to get on board of the catamaran. Check in, meals and overnight on board. On that day, after breakfast, leave on the catamaran to Nosy Komba (Nosy in English means island). It is a place where visitors can enjoy close contact with domesticated lemurs (the black lemurs or Eulemur Macaco Macaco) because the easily come to eat bananas in tourist’s hand and come and stay on their shoulders. But this island has very nice beaches too, ideal for swimming. Back on the catamaran for relax. After breakfast, departure to another island called Nosy Tanikely. This island presents a broad sandy beach and the under-sea world around is wonderful because of its shallow reefs and sea grass attracting turtles and countless colorful fishes. It’s a favorable place for those who have passion for submarine dives and free diving. Afternoon free, at leisure and overnight on board. Back to Tana with an optional visit to the crafts market according to the arrival time from Nosy-Be before flying out from Madagascar. Assistance of a guide at the airport. After the delight full breakfast, leave to Perinet, 150km East of Tana for about 3h drive through a beautiful landscape of rice paddies and wooded hills. At midway, stop at a special place called the Pereyras reptile farm to see about 20 species of chameleons from the largest one in the world called the Parson’s chameleon of approximately 60cm long to the smallest in the world, the Brookesia minima which can stand on a match stick. But this private park provides shelter for snakes, amazing colorful frogs such as mantillas and the tomato frogs, geckos and tenrecs. Then drive again to Perinet. On the arrival, straight to the Indri Special Reserve, part of the national park, to see the largest species of lemur called the Indri. After that, check in at the hotel. Breakfast and then visit of another park called Vakona private reserve that encompasses 2 parts: the first one is the lemur’s island where 4 species of lemurs live on a small island. The highlight of this visit is that you can feed the lemurs and caress them. They will jump on your shoulders and heads. The second part of the visit will allow you to see and to have an idea of how the Fosa looks like. 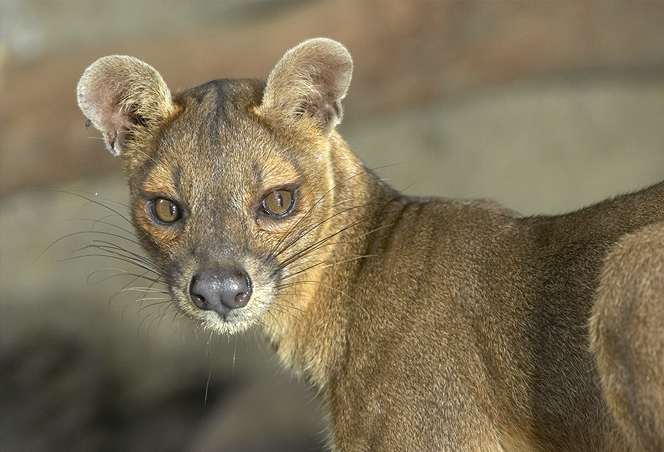 The Fosa is the largest endemic carnivore living in Madagascar. Radiated tortoises and boas are to be seen also there. Then, back to the hotel for check out then drive back to Tana for overnight. Overnight at the hotel bed and breakfast. 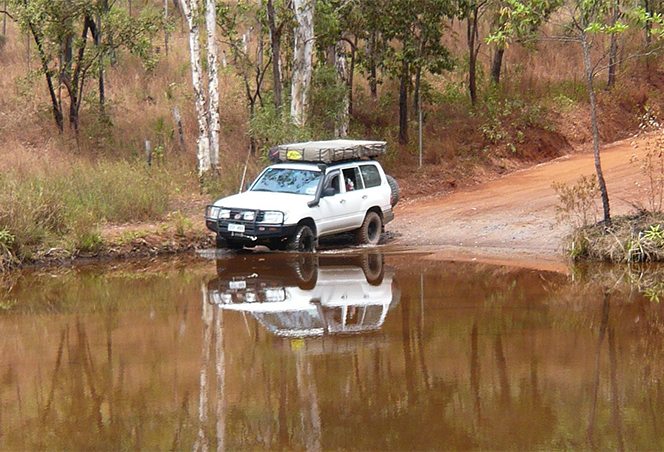 Leave Tana – follow about 06 hours drive to Miandrivazo where starts the river trip the next morning. Early in the morning, we start going down the TSIRIBIHINA River. The trip is slowly and you can relax. At night the boat will be pushed over a sandbank and you camp at night. Meals are served on board. Camping on full board. Continuing going down. At Anosin’Ampela, a wonderful waterfall, you can take a shower. This part of trip leads you to beautiful landscapes, Baobab trees and Step Mountains. Camping on full board. Arrival at Belo on direction of the Tsingy de Bemaraha. In the afternoon, we have a slight walk around Bekopaka. Overnight at the hotel on full board. After breakfast – pirogue ballad along the Manambolo Gorge (about 01h30), then departure for the small Tsingy trip. After breakfast – follow about 1h30 drive to join the departure point of the Big Tsingy. Excursion of 06 hours with amazing panoramas. Come back to the hotel at the end of afternoon. Overnight on full board. Drive back to Morondava via the trail of Tsimafana . Stop at the baobab avenue to enjoy the sunset. Overnight at the hotel on half board. After breakfast, transfer to the airport – fly to Tana – Check in to the hotel , overnight on bed and breakfast . Overnight at Relais des Plateaux. After breakfast, leave to Perinet, 150km East of Tana for about 3h drive through a beautiful landscape of rice paddies and wooded hills. Overnight at Vakona Forest Lodge on Half Board for three nights. Later in the evening, after dark, guide nocturnal walk to spot for mouse lemur, woolly lemur and pigmy chameleon. Overnight at the hotel. The second part of the visit will allow you to see and to have an idea of how the Fosa looks like. The Fosa is the largest endemic carnivore living in Madagascar. Radiated tortoises and boas are to be seen also there. Overnight at the hotel. After breakfast you will be transferred by vehicle to Antsirabe, a town situated approximately 170 km south of Antananarivo. Antsirabe is a large town which contains much of the manufacturing industry of Madagascar. One of the major features of this town are the very large number of « Pousse pousse » or as we know them, rickshaws. Being fairly flat country this is an easy way to get around the town. Here you will come across an incredible variety of polished semi-precious stones and many Ammonites found on the island & available for the collector and others alike. The drive takes approximately 3 hours. Overnight at Hotel des Thermes. After breakfast you will continue your journey (about 7hrs drive) to Ranomafana (hotwater) , a beautiful national park established in early 1990 to protect the rare and newly discovered Golden Lemur. 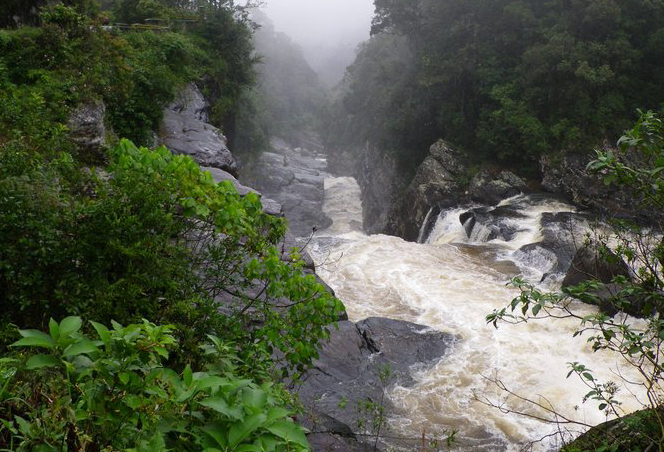 The area is dominated by the Namorona River and is fed by many streams ending in a waterfall close to the park entrance. This forest is a combination of both secondary and primary forest. Overnight at Centrest for three nights. Wildlife viewing is best from about 5h00 – 10h00. This is one of the most important mammal sites in Madagascar. Mammals that may be found are the Golden Bamboo Lemur, Greater Bamboo Lemur, Grey Bamboo Lemur, amongst others. Hard to see are the Fosa and Aquatic Tenrec. Birds to look for include the Blue Coua, Red-fronted Coua, Pollens Vanga, Tylas, Henst’s Goshawk, Forest-rock Thrush, Collared Nightjar, Sunbird Asity, Velvet Asity, Madagascar Flufftail, amongst many others. Reptiles such as the Parson’s chameleon, Madagascar Tree Boa, Day Gecko, three Leaf-tailed Geckos and numerous frogs may also be sees. Overnight at the hotel..
Another whole day to explore another fragment of the National Park. Night walk and overnight at the hotel. Travel day of about 12 h drives. Fly from Tana to the North-East side of Madagascar in a town called Maroantsetra where someone will welcome and assist you. Then transfer to the harbor to take a speed boat for the Masoala Peninsula. The boat trip lasts about 2h with good chance to see dolphins and hump backed whales from July to September. Landing on the beach in front of your lodge. Check in and meal. Overnight Masoal Fores Lodge or Petit Relais. After breakfast, a short walk on the beach will take you to the Masoala National Park’s entrance. The park’s wildlife is very rich encompassing lemurs, birds, frogs, chameleons and soon but the highlights are indisputably the Red ruffed lemur and the Helmet Vanga bird. The park has other target birds (Bernier’s Vanga and Serpent Eagle) and lemurs (Aye Aye) but they are very elusive. Afternoon free: relax or walk on the beach or swimming. Night walk in another part of the forest around the camp. Overnight at the Lodge. In the morning, after breakfast, exploration of another section of the forest. It is a coastal forest. Birds, frogs and chameleons are to be seen here. All endemics. Afternoon, a canoe trip on the Tampolo River will give another view of this forest. Overnight at the Lodge. Leave the Peninsula on board the speedboat and drive to Nosy Mangabe to see a specific colorful frog family (The Mantella Laeviegata) and many leaf-tailed geckos sleeping during the daytime as they are nocturnal. White fronted brown lemurs will accompany you during this visit, jumping from tree to tree. Then come back to the boat and drive back to the camp. Overnight at the Lodge. After breakfast, drive back to Maroantsetra to catch the flight to Tana. 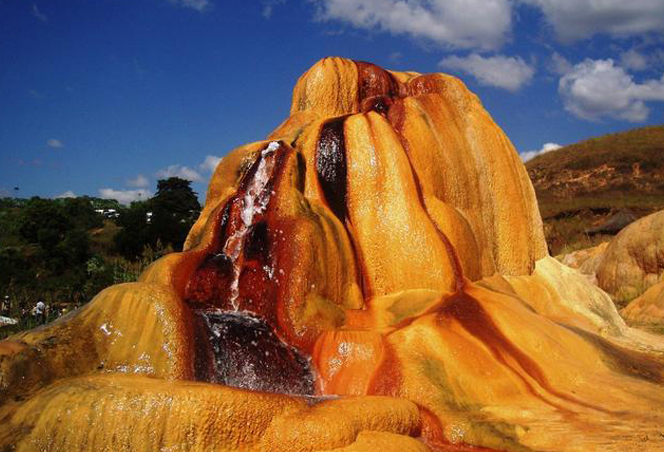 After breakfast, drive to Antsirabe located 160 km south of Tana and founded in 1872 by Norwegian missionaries attracted by the cool climate and the healing properties of the thermal springs. But at halfway, stop in the town of Ambatolampy to visit some workshops were aluminum cooking pots are locally made by skilled workmen. Most of the cooking pots that we use in Madagascar come from this town. After that, leave Ambatolampy to Antsirabe through a panoramic view of the Merina ethnic group countryside made up of rice paddies, cornfields, vegetable fields and typical Merina family tombs. On this road portion, possibility to see one of the most famous cultural ceremony: the FAMADIHANA (turning of the bones) by the Merina and Betsileo people, two ethnic groups leaving on the highland. Briefly, this ceremony consists of opening the family tomb, taking out the bodies wrapped in silk shroud, keeping them in the village outside the houses while traditional music is blaring and all the people dancing. On that first day, the bodies are wrapped in new silk shrouds. Meals are especially rice and pork meat, local rhum flowing freely. That can last two or three days according to what have said the soothsayer when is the blessing time to put them back again in the tomb. During the whole ceremony, all visitors are welcome to dance, eat and drink on the traditional music rhythm. Note that the best time to see this ceremony is on August- September. Arrival in Antsirabe in the afternoon, visit of the workshop of semi-precious and ornamental stone, cut or rough called “chez Joseph” as Antsirabe is also known as the capital of semi-precious stones. Then visit of the local market to see the fruits and vegetables and local products of the area followed by a rickshaw (known as pousse-pousse) trip back to the hotel for a dinner and overnight. After breakfast, visit of two lakes around Antsirabe which are both crater lakes as Antsirabe is on a volcanic region. The first one, called Tritriva, lies at about 17 km of Antsirabe. This lake has some interesting features: the water level rises in the dry season and the presence of two thorn trees growing on the edge above the water with intertwined branches. Legend says that these are two lovers, Rabeniomby and Ravolahanta, forbidden to marry by their parents who drowned themselves in the lake. So when the branches are cut, so they say, blood, not sap, oozes out. On the way back to Antsirabe, from Tritriva lake, stop at the second lake Andraikiba which is bigger than Tritriva. Here, possibility of a safe boat trip on the lake. In the afternoon, drive to Ambositra for 90 min, continuing to pass through typical highland scenery of rice paddies and low hills. Arrival in Ambositra in the late afternoon for dinner and overnight. After breakfast, before leaving to Ranomafana, visit of a woodcarving and sculpture workshop as Ambositra is known to be the center of the wood carving industry of Madagascar. The best place to see that is at “Jean et Frères workshop”. Opportunity to see workers carving and to do shopping too. 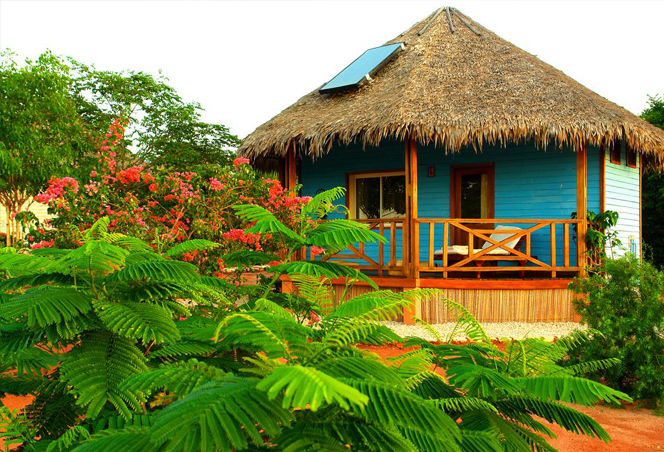 Then depart for Ranomafana, which is at about a 5-hours-drive from Ambositra. From here, it will be the area of the Betsileo ethnic group with its neat rice paddies interspersed with eucalyptus and pine trees. Few kilometers after leaving Ambositra is the junction to Antoetra; the nearest Zafimaniry village to the main road. The Zafimaniry is a small ethnic group living in the forest, east of Ambositra. The only way to get there is 3h walk from Antoetra through forest hills and valleys. But once there one can enjoy seeing the Zafimaniry people with their simple and traditional way of life as well as the picturesque houses showing that woodcarving is still the main industry. Let’s close the Zafimaniry brackets. Arrival in Ranomafana in the late afternoon. Check in at the hotel before a night walk along the main road to see mouse lemurs and numerous chameleons of different species. After breakfast the whole morning to explore the Ranomafana National Park which is a nod altitude rainforest to spot locally endemic lemurs such as the very endangered greater Bamboo lemur, and the locally endemic Golden Bamboo Lemur and the Milne Edwards Sifaka. But beautiful frogs, geckos, snakes and birds are to be seen as well. In the afternoon, visit of the Tanala village of Ambodipaiso. Tanala is the name of another ethnic group living in Ranomafana and around and means “those from the forest”. This visit consists of a show of traditional dances and songs, a meeting with the farmers, basketwork learning, as well as the visit of a primary school and a Tanala home. And before leaving the village, one can enjoy tasting the Tanala koba, a sort of cake made from rice flour and banana as well as the Sambaika “slices of cassava”. Then come back to the hotel for dinner and overnight. After breakfast, heading for Ambalavao, going through Fianarantsoa. This big town, capital of the Betsileo ethnic group, built on hill like a small-scale Antananarivo was founded in 1830 as a garrison for Merina soldiers seeking to conquer the South of Madagascar by a Merina king. Few kilometers, south of Fianarantsoa, the road will go by the wine area of Madagascar. Possibility of visiting a wine cellar and wine tasting. In the afternoon, in Ambalavao, visit of Antemoro paper factory. This sort of parchment, made from the bark of an endemic tree called “avoha” with natural flowers is one of the pillar of the Malagasy handcrafts. Next to this paper factory is the silk weaving workshop. Then a walk through the village of Ambalavao to be in a closer touch of the inhabitants. In the morning, departure for the Isalo National Park. On the way, stop at the community park of Anja. 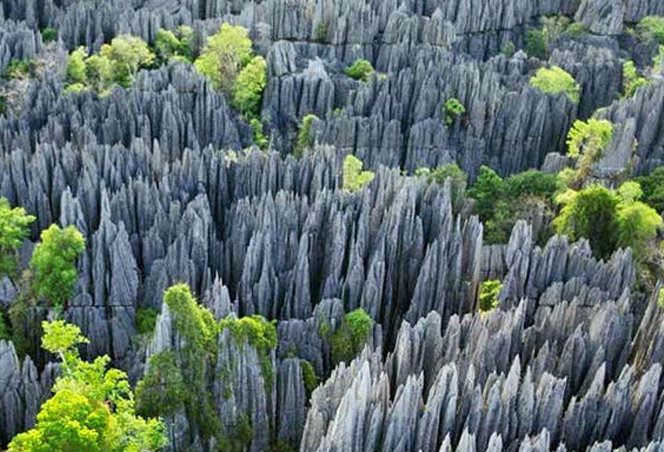 The highlight will be the spotting of a colony of Ring- Tailed lemurs living in this area dominated by stones, granite domes and some short trees. Then keeping on driving through a landscape of savannah grassland and rocks. From here, we travel into another ethnic group area called Bara, told to have Masaï roots, from east Africa. The road passes through Ihosy town, capital of the Bara tribe. These people have really different customs and most of them turn around the zebu, this typical cattle with prominent hump on its back. The zebu has a very important place in their society from birth, passing by wedding and especially at death. After Ihosy, the road climbs to reach the top of a plateau named Horombe before arriving in Ranohira, the village learning against the Isalo National Park. Check in, dinner and overnight at the hotel. A whole day to explore this sand stone rock formation eroded by sun and rain, giving a unique and amazing landscape. Pools, canyons and crevices cracks are to be seen as well as lemurs and reptiles. Isalo Mountains is not only beautiful but is also a sacred place for the Bara tribe as they used caves and canyons walls as burial sites. 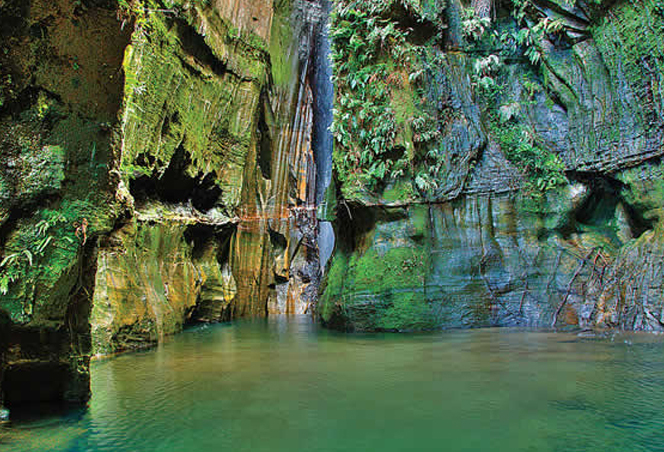 The two most popular hiking excursions are the “piscine naturelle”, a natural swimming pool and the Canyon des Makis. In the afternoon, visit of the Isalo Interpretation Center to learn more about the people living around the park, as well as the wildlife in the national park itself and some of the Bara Traditions. After this museum, short drive to the “Fenêtre de l’Isalo” (Isalo window) a natural rock formation providing a window to the setting sun. Then back to the hotel for dinner and overnight. In the morning after breakfast, drive through a scenery of grassland and palms. On this portion, the road will pass by some villages of sapphires running working, the most famous is Ilakaka, a village that has sprung up like an American gold rush town. Later, the road passes in the middle of a thick deciduous dry forest. This is Zombitse park. The visit of this park will allow seeing and touching a thousand year old baobab, his size and how majestic he is. Here, there is a opportunity to see another species of lemur: the Verreaux Sifaka, a night active lemur sleeping during the day time in cracks of trees and one of the largest species of chameleon in the world: the oustalet’s chameleon. After this visit, continuing to drive towards Tuléar, the Vezo ethnic group capital. The Vezo people are mostly fishermen. The places which are really to be visited are the artisanal market displaying the local crafts, the botanical garden growing especially most of specific plants of the south of Madagascar, mainly thorny plants and succulents, and the local market. After breakfast, transfer to the airport, fly to Tana , then fly out .